Buying prescribed sunglasses is a lot easier with Glasses Direct. It is one of the premier fashion eyewear stores in the UK. Their technical team is ready to help you with all your queries and give you professional advice on selecting the correct frame. They also provide an option to add extra lens and coatings. You have varied options of female and male glasses to select by frame shape, style and colours. So, whatever you want, rimless glasses or semi-rimless, wayfarers, aviators or varifocals, Glasses Direct is your answer. Check out the following video and have a look at London Retro's 'Metropolitan' collection by Glasses Direct. This collection is retro-inspired. Avail Amazing Glasses And Frames At Discounted Rates! Apart from above, we have many other deals from Glasses Direct and fashion eyewear. All these deals are free for using and you can subscribe or sign up to get updated deals and newsletters in your mailbox. Browse the website and choose from number of frame options available. You can also opt for home trial or additional lens options along with the desired frame. Select the frame you like. Check if it is available in the colour you want. Ensure that all the other specifications are accurate. Choose from the available lens options like reading distance, single vision, etc. Fill up your personal details and prescription details. Register on the site and create an account. Proceed to checkout and you will find an area for a promotional code. Enter the relevant promo code you have and you will get a discount on your final payment. Glasses Direct is an online retailer dealing in wide range of spectacles, including prescription sunglasses. It was started by James Murray Wells in 2004. You can go the store, have an eye check-up and get your sunglasses made accordingly. 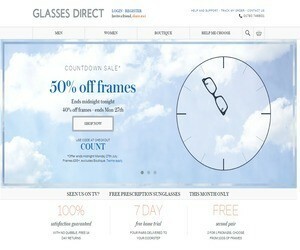 They also give you frames for free home trial to help you decide on the right frame for yourself. They have exchange policy without any extra charges if you don’t like the pair of the sunglasses. Use any of our Glasses Direct free discount vouchers and turn browsing into purchasing!